The Edinburgh born midfielder started his career with Heart of Midlothian, making his debut for the club at the age of 18 in October 1976. However his impressive skills and trickery were not enough to save the Hearts from relegation but his 13 goals the following season helped fire them to promotion. 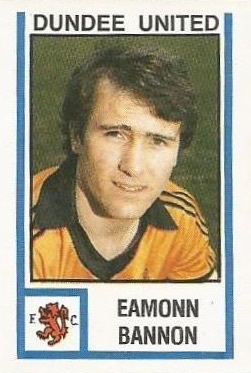 In 1979, Eamonn was sold to Chelsea for £220,000, most of which was used to pay off debts that was threatening the future of the club. 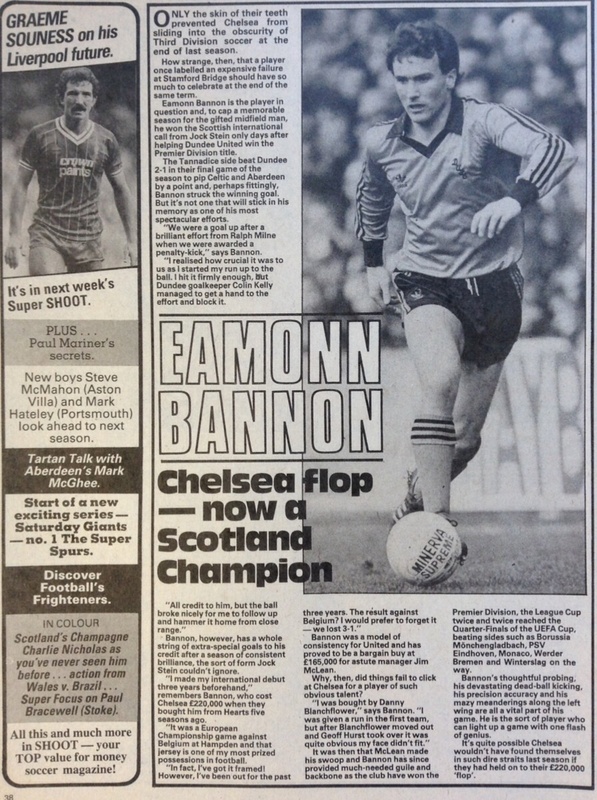 Bannon started well with Chelsea, scoring his only goal for the club in his third appearance. However the club were relegated at the end of the 1978/79 campaign and a change of manager the following season saw the young Scottish playmaker fall out of favour. 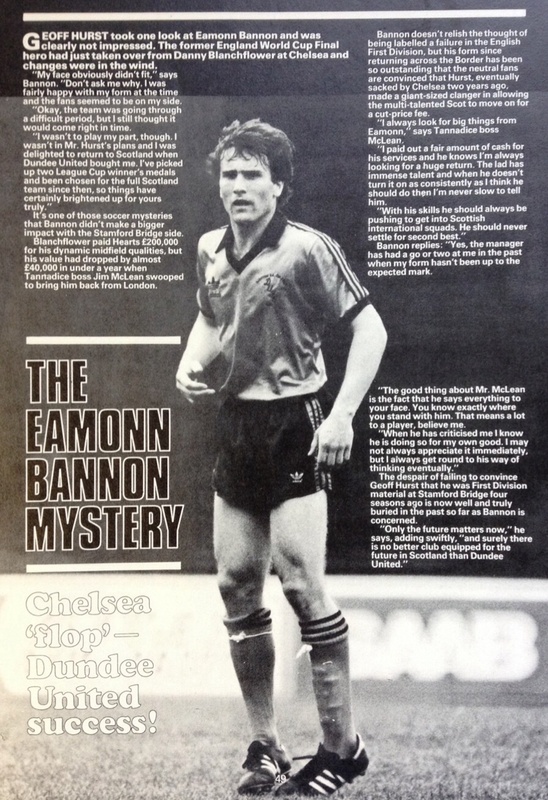 In October '79, United manager Jim McLean paid £165,000 to bring Eamonn Bannon to Tannadice - a Scottish transfer record at the time. 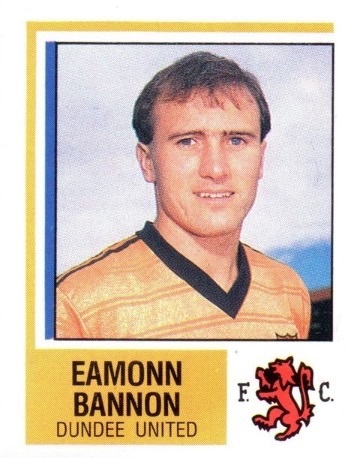 Eamonn made his United debut the following day and scored his first goal for the club just days later in a memorable 3-0 win at Pittodrie, and he quickly established himself as a regular in the great Dundee United side of the late 70s, early 80s. 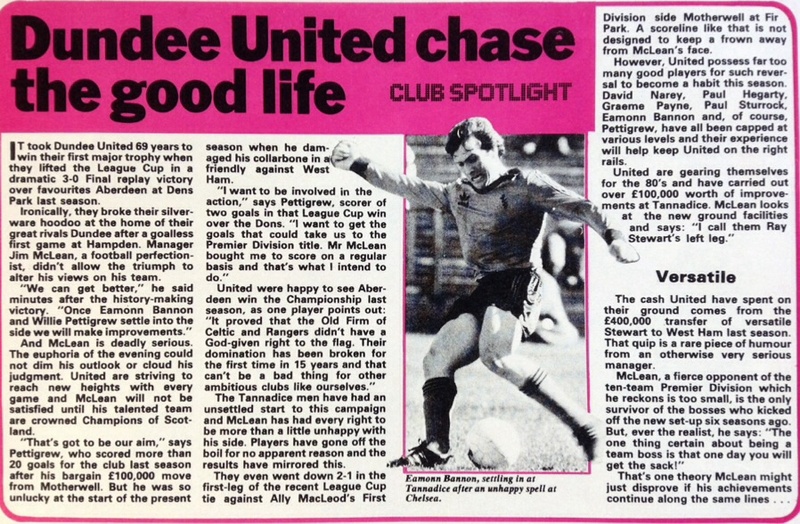 In December '79, just six weeks after joining United, he was part of the team that won the club's first ever piece of major silverware, starting in the 3-0 League Cup Final Replay demolition of Alex Ferguson's Aberdeen at Dens Park. Just one week later he earned his first International cap against Belgium at Hampden Park, having previously been a Scotland Under-21 internationalist - see ‘International’ tab. 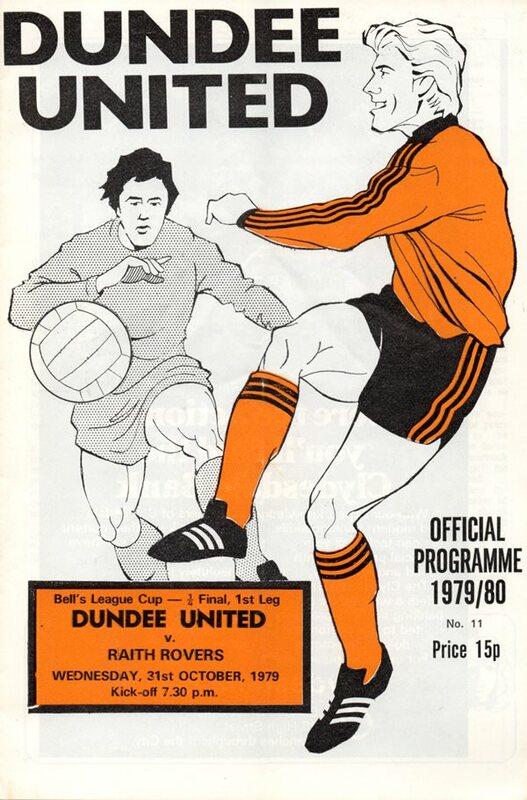 The following season United retained the League Cup with a famous 3-0 win over Dundee, with Bannon again a major influence, having played in all eleven games in the competition, scoring four times en-route to the final. He also played in every match in United’s run to the Scottish Cup final that season, scoring in the semi-final victory over Celtic, before collecting his first runners-up medal after the final against Rangers. 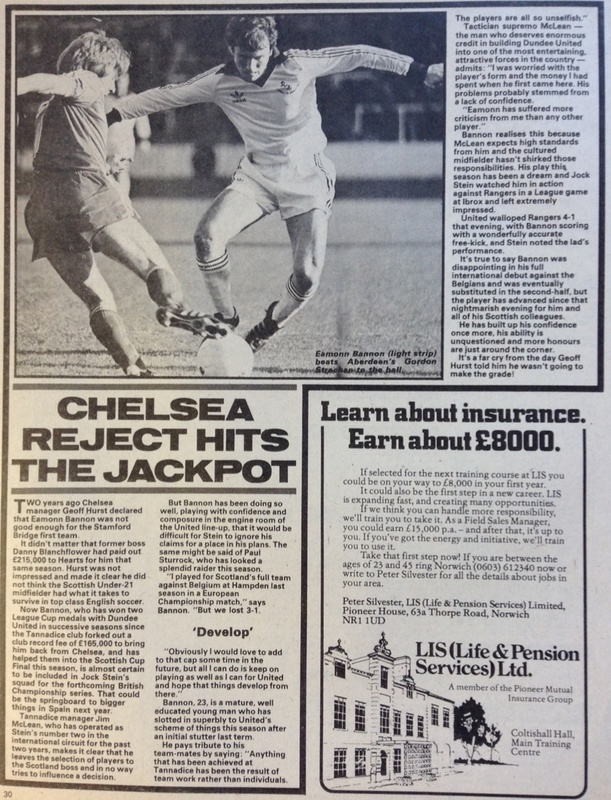 The 1981/82 season saw a memorable European run for United, beating Monaco, Borussia Monchengladbach and Winterslag to reach the UEFA Cup Quarter Finals. Bannon scored in all three ties including what is considered to be one of the greatest United goals of all time: a mesmerising solo run from wide left on the half way line and a clinical finish in the 5-0 thumping of Germans Monchengladbach. 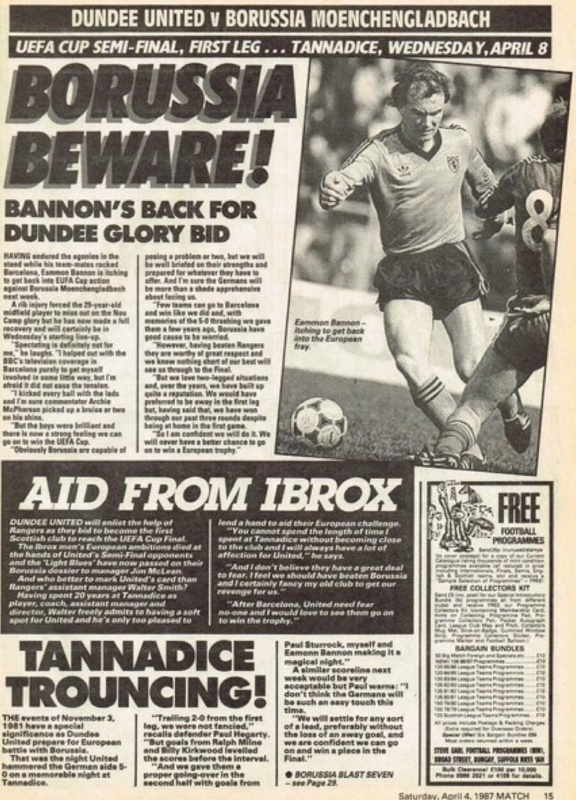 Bannon helped United reach a third consecutive Scottish League Cup final in season 1981-82, scoring a hat-trick away against Ayr United, but they lost narrowly to Rangers in the final. 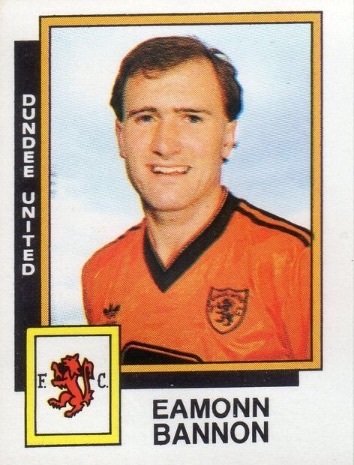 1982/83 would prove to be the greatest season in the history of the club and Eamonn played a crucial role in securing the Scottish Premier Division Title, scoring 13 goals including the winning goal at Dens Park on the final day of the season. 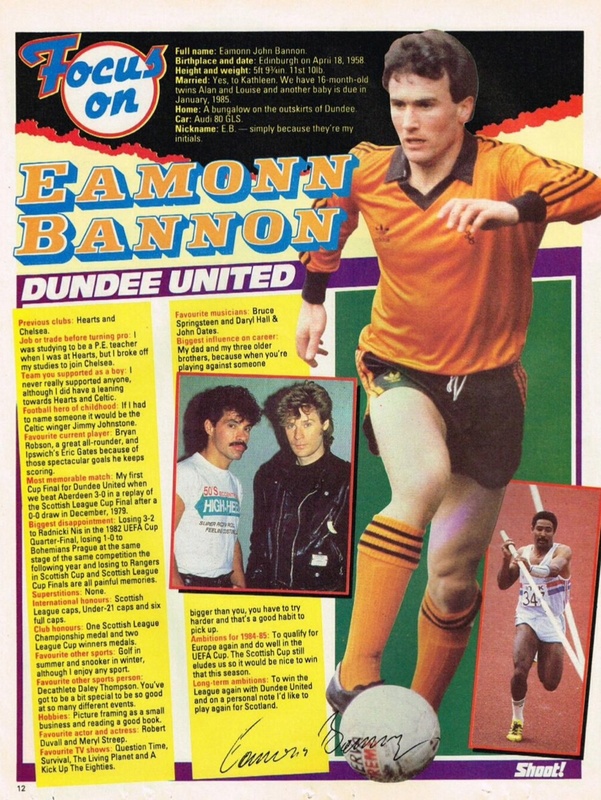 Bannon remained a vital part of the team over the next few years, playing a key role in the club's famous European runs in the 1983/84 European Cup and the 1986/87 UEFA Cup, where he collected a runners-up medal as United became the first Scottish Club to reach the UEFA Cup final. 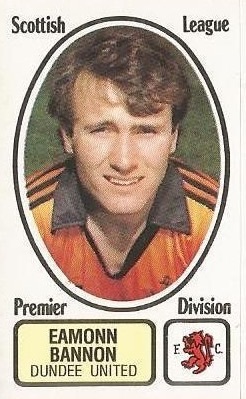 He also collected runners-up medals in the 1984 League Cup final, and the 1985 and 1987 Scottish Cup finals. Dependable from the penalty spot, Eamonn finished the 1985/86 season as the clubs top scorer with 15 goals, six of them spot kicks. 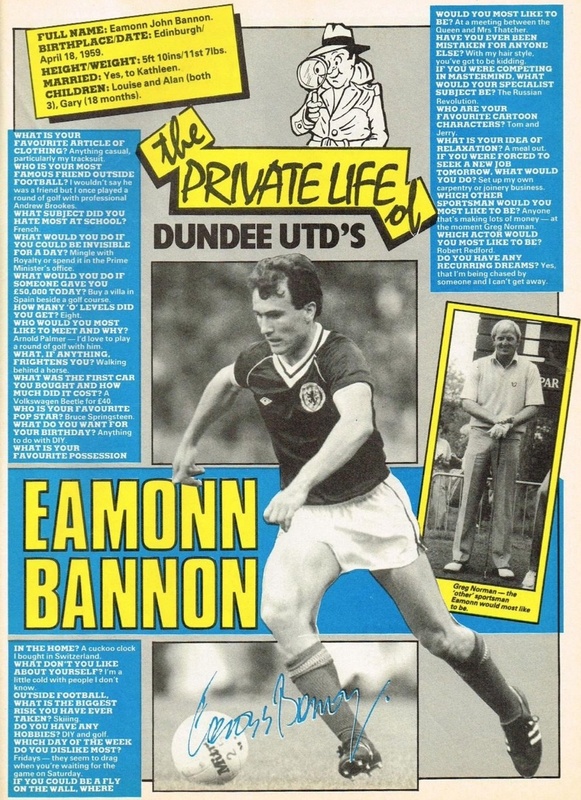 His last match for United was the 1988 Scottish Cup Final, and following an extremely successful career at Tannadice, Bannon left at the age of 30 to join his former club, Hearts, for a reported fee of £225,000. He spent five seasons back in Edinburgh, before finishing his playing career with short spells with Hibernian and Stenhousemuir, where he helped them win the 1995 Challenge Cup Final, defeating United in a penalty shoot-out. 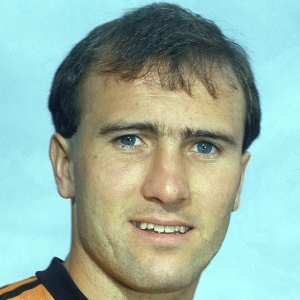 In 1996 he had a short spell as Falkirk manager, and in January 2009 he was inducted into the Dundee United Hall of Fame. 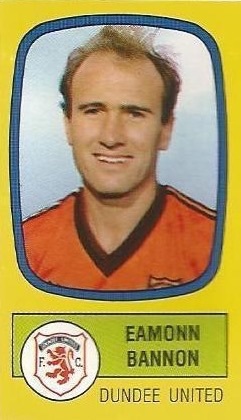 Eamonn was born on this date in Edinburgh. A game reminiscent of the previous Wednesday night's U.E.F.A. tie at Tannadice where, once again, despite constant pressure, United failed to find the net. 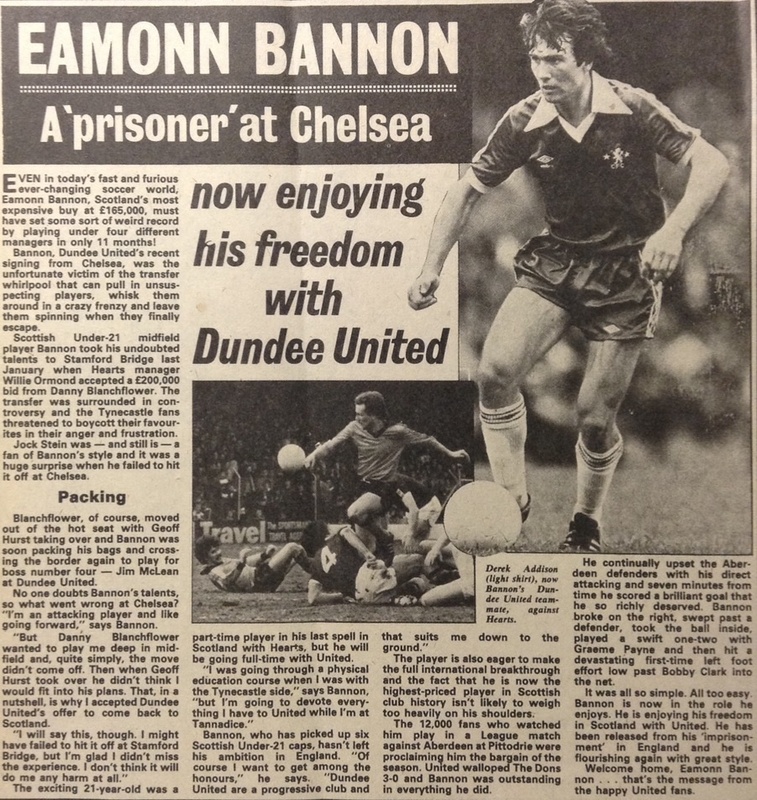 The game was marked by the first appearance in a tangerine shirt of Eamonn Bannon, United's £165,000 buy from Chelsea, signed only the day before. Right from the kick-off both sides served notice that this was going to be a much more positive Cup tie. With the Tannadice pitch in reasonable shape considering the torrential rain, we opened strongly and a lightning burst from defence by Jirn Mclnally and an early cross saw Hamish French head over. Our next attack brought the opening goal after five minutes. Hamish French won the ball out on the right and his cross was flicked on by lain Ferguson and was cleared to the edge of the box, where Eamonn Bannon collected it and fired in a low shot which struck the inside of Carson's right hand post before going in. Tom Carson was in action again in nine minutes cutting out a Kevin Gallacher cross after a fine run. Dundee's first chance came two minutes later but ran Angus headed narrowly past. Dundee came more into the frame of things but without testing Alan Main. Three minutes from half-time we scored a brilliant second. A high ball wasn't cleared by the Dundee defence and Eamonn Bannon overhead kick beat Tom Carson. A minute later we almost got a third when a swift break gave Kevin Gallacher a shooting chance but his shot was defelcted for a corner.